Piano program is at risk for SLC school that broke poverty threshold and lost $145K in Title I funds. 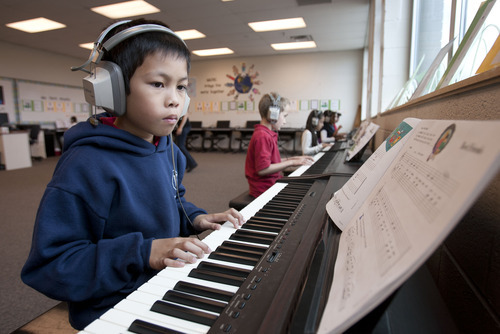 Steve Griffin | The Salt Lake Tribune Whittier Elementary School third grader, Aizhy Lumacad, plays the piano during class at the Salt Lake City school. The school is losing its federal Title I funding next year, and a school-wide music program is threatened by the loss. It gives every Whittier student a chance to learn music with an emphasis on the piano. Steve Griffin | The Salt Lake Tribune Whittier Elementary School fourth graders play pianos during class at the Salt Lake City, Utah school Monday May 20, 2013. The school is losing its federal Title 1 funding next year, and the school-wide YEF music program will be impacted by the loss. The music program gives every Whittier student a chance to learn music, with an emphasis on the piano. 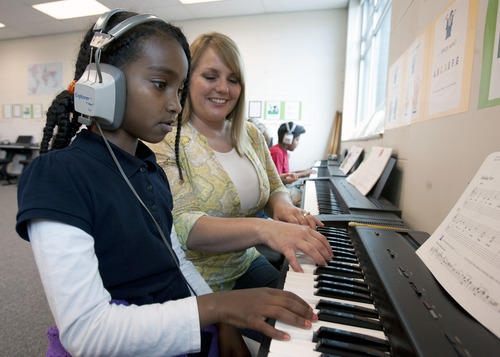 Steve Griffin | The Salt Lake Tribune Whittier Elementary School third grader, Fikir Teklemedhin, plays the piano for her music teacher, Melanie Witbeck, during class at the Salt Lake City school. The school is losing its federal Title I funding next year, and a school-wide music program is threatened by the loss. It gives every Whittier student a chance to learn music with an emphasis on the piano. 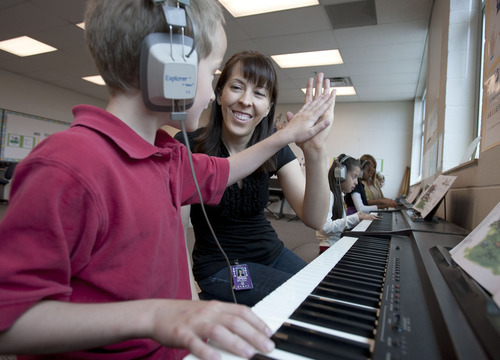 Steve Griffin | The Salt Lake Tribune Whittier Elementary School third grader, Zach Tragakis, high-fives his music teacher, Colette Lofgren, during piano class at the Salt Lake City school. The school is losing its federal Title I funding next year, and a school-wide music program is threatened by the loss. It gives every Whittier student a chance to learn music with an emphasis on the piano. At Whittier Elementary, a treasured piano program shares the joy of music with students  from kindergartners who learn about rhythm to sixth graders who study composers and can play at weekly lessons. But Whittier is losing its federal Title I funding, which supports low-income students, and the change has parents scrambling to save the Youth Enrichment Foundation Piano Program. "The benefits of learning music at a young age are well known and include higher ACT and SAT scores," said Mindy Tueller, Whittier PTA treasurer, in an email. The program has been funded by the school&apos;s discretionary funds and donations from the community, said Principal Margery Parker. But she told the parent-teacher organization that with the loss of $144,875in Title I funds, she can no longer provide the school&apos;s usual share. The federal funds are allocated to school districts based on the number of children they have living in poverty. Each Utah district then decides where to set its own qualifying poverty rate for schools, calculated by the number of students eligible for free or reduced-price meals. 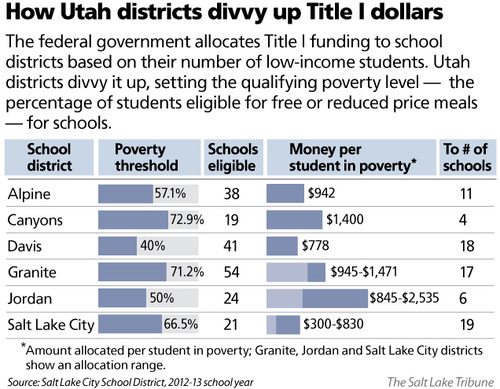 The Salt Lake City School District splits its Title I funds among 19 schools where 66.5 percent of students are considered poor, sending between $300 and $830 for each student in poverty. The number of such students at Whittier has slipped below that threshold. By comparison, the Jordan School District sends up to $2,535 per student, concentrating its funding in six schools that meet its qualifying poverty rate of 50 percent or higher. The Salt Lake City School District gives schools time to adjust when they lose funding, said spokesman Jason Olsen. "As demographics and things change those [Title I] schools can change," he said. "It is a financial constraint on some schools, but something they know about for awhile." Bryant Middle School now qualifies under the district&apos;s standard and will begin receiving the funding this fall, he said. Officials estimate Whittier&apos;s music program has been offered to students for at least 18 years, and Freightliner of Utah Trucking Company is its major donor. To help raise the $10,000 needed to save it, a walkathon will be held on Friday. The community may donate by clicking on: Whittierelementary.jbfsecure.com/. Music teacher Colette Lofgren said the community comes together once a year for the student piano recital. "The students dress in concert dress, learn concert manners, announce in front of an audience and perform a piano solo," Lofgren said. "It&apos;s a big moment for these students, and they feel so proud." Parker downplayed the impact of the loss of Title 1 money. In some ways, she said, Whittier Elementary is a victim of its own academic success. Located at 1600 S. 300 East, it has seen student academic scores increasing the past several years. Title I money is often used to boost academic programs, such as adding staff, after-school tutoring and math and reading labs. "We&apos;re going to be able to operate just like we used to," Parker said. "The school districts know what schools are in need the most." The federal government allocates Title I funding to school districts based on their number of low-income students. Utah districts divvy it up, setting the qualifying poverty level  the percentage of students eligible for free or reduced price meals  for schools. $942 per student in poverty is sent to 11 schools.